What Is A Supercontinent And A Superocean? Supercontinents and superoceans are larger in size than the present continents and oceans of the world. Pangea, Laurasia, and Gondwana are all examples of supercontinents. Supercontinents and superoceans are more massive than the world’s present continents and oceans. In simple terms, a supercontinent is a vast landmass which arises from the convergence of several continents. The single global ocean which surrounds this landmass is subsequently called a superocean. Alfred Wegner is noted as the first scientist to explain in depth the concept of supercontinents, beginning in 1912. He included the idea in his theory of continental motion. He supported his theory with a body of new as well as old evidence to suggest that the continents of Earth had once been part of a single body in late Paleozoic period. Initially, Wegner termed it "Urkontinent" and subsequently Pangaea to mean all of Earth. The theory presented by Wegner formed the basis of modern day plate tectonics. 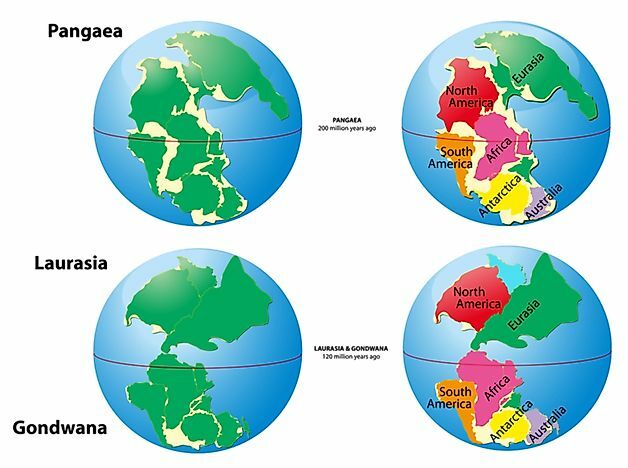 As scientists began understanding how continents had shifted in the past, they began searching for earlier Pangeas. The term supercontinent denotes one continental landmass which consists of all or most of the continental blocks of Earth. Every 400 to 500 million years, a cycle of supercontinents seem to merge and split fueled by plate tectonics. Scientists suggest that there was the presence of a minimum of seven supercontinents on Earth. The last supercontinent is infamously known as Pangea, and merged about 300 million years ago and disintegrated nearly 100 million years after. Scientists have identified a supercontinent named Kenorland which existed approximately 2500 million years ago. The landmass is named after the Kenoran orogeny, and it is also referred to as Paleopangaea. Another supercontinent named Columbia completed its integration in 2100 Ma and its disintegration in 1400 Ma. The core of this supercontinent remains intact as Laurentia or the Canadian Shield which is the world's current largest craton. The supercontinent has been given such names such as Protopangaea, Nuna, Hudsonia, or Nena. The supercontinent Rodinia was named by Mark and Diana McMenamin, and it lasted nearly 400 million years before disintegrating. Rodinia's configuration and history are heavily debated. A Superocean denotes the waterbody that surrounds a supercontinent. The concept is sometimes used to define any ocean bigger than today's the Pacific Ocean. Panthalassa was the Superocean that surrounded Pangaea. As surface water shifts unobstructed from east to west in superoceans, it usually warms up from the exposure to sunlight, and the western edge of the ocean becomes warmer than the eastern. Seasonal temperature changes which were probably more rapid inland may have resulted in powerful monsoons. The mechanics of superoceans are however not well understood. Mirovia may have been a Superocean surrounding the supercontinent named Rodinia in the Neoproterozoic Era. The superocean is also called Mirovoi and it existed approximately 1 billion to 750 million years ago. Mirovia may either be essentially similar to the Pan-African Ocean or the precursor. The Pan-African Ocean is thought to have existed before the disintegration of the supercontinent of Rodinia. The closure of the Pan-African Ocean resulted in the formation of the supercontinent of Pannotia. Another Superocean is Panthalassa which formed the border of the supercontinent Pangaea. The global ocean was much bigger than the Pacific.